It looks like Air China is planning to offer some crazy prices on a few seats from Canada to cities in China, SE Asia, India, and Pakistan over the upcoming Black Friday to Cyber Monday weekend. Their promotional material only suggests that fares from Vancouver and Montreal will drop as part of the sale. But it seems likely (although not guaranteed) that these prices will also be available from Toronto as well. Think of it as a bit of a door-crasher for airfares. This is actually quite rare for an airline to do. Many airlines (and travel agencies) will jump on the Black Friday / Cyber Monday promotional marketing bandwagon and *pretend* to have sales, but true door-crasher price levels are relatively non-existent in travel from what I've seen over the years. 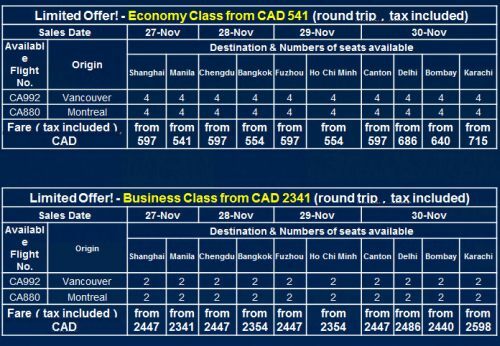 On Friday, Nov 27 Air China will drop the price of their Montrelal/Vancouver (and hopefully Toronto) to Shanghai, China (PVG) and Manila, Philippines (MNL) flights down to $597 CAD and $541 CAD roundtrip including taxes, respectively. It looks like there will only be 4 seats available to each destination. If this is true (and they're not just trying to create a frenzy), it means that the available seats will likely go *fast* once the fares are loaded. The available date range for travel will be between November 27, 2015 and March 26, 2016. And then on Saturday, Nov 28 - It will be the exact same thing, but Air China will drop the price from Montreal/Vancouver (and hopefully Toronto) to Chengdu, China (CTU) and Bangkok, Thailand (BKK) down to $597 CAD and $554 CAD roundtrip including taxes. I'm guessing the 4 seats to Thailand will also be snapped up quick! And then on Sunday, Nov 29 - It's Montreal/Vancouver/Toronto to Fuzhou, China (FOC) and Ho Chi Minh City, Vietnam (SGN) that will drop to $597 CAD and $554 CAD roundtrip including taxes. Karachi, Pakistan (KHI) - $715 CAD roundtrip including taxes. You will want to be on this page the moment that Air China drops their fares, as the seats will no doubt be snapped up quickly. At this time, it is unclear exactly what time Air China will be dropping the fares. It's probably best to assume that it will be on Thursday, November 26 at 11:59 PM EST. UPDATE #1: Tried numerous times before and after midnight, but so far there's no indication that these fares have ever become available. UPDATE #2: Nov 27 at 10:30 AM EST - Sorry, these fares do *NOT* appear to have become available from Toronto. They are however, currently available this Black Friday morning from Montreal and Vancouver. 2. Scroll down to the very bottom of the promotional page and search for your fares. Use dates between November 27, 2015 and March 26, 2016 when you search. My guess is that Christmas dates will be blacked out, but who knows. Where to stay in China, Thailand, the Philippines, Vietnam, or India? The following AirBNB links will lead you to some great deals on places to stay in Shanghai, Manila, Bangkok, Fuzhou, Ho Chi Minh, Guangzhou, Delhi, or Mumbai for under $39-$59 CAD/night for 2 people. toronto, yyz, flight deals, bangkok, thailand, asia, southeast asia, east asia, china, delhi, india, del, shanghai, pvg, manila, philippines, mnl, bkk, mumbai, bombay, bom, ho chi minh city, saigon, vietnam, sgn, guangzhou, can, fuzhou, foc, chengdu, ctu, air china, black friday, cyber monday, canton, south ashia, karachi, pakistan and khi. 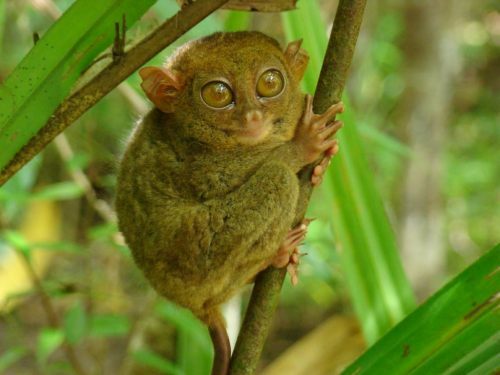 8 Responses to "Black Friday Deal: Toronto to China, Philippines, Thailand, Vietnam, India, Pakistan - $541 CAD to $715 CAD roundtrip including taxes"
Your deals are the best! Does not work. Cannot figure out how to book the flights. Unfortunately these never became available from Toronto. It was just a guess that they would also become available from YYZ. It's not very often that Toronto is looked over vs other Canadian cities! Usually it's the other way around. The prices became available this morning from Montreal (and Vancouver) at approximately 10 AM EST. I saw the price for Vancouver around 4AM this morning. But never found this price, anyone knows how to get this price for Montreal? Any idea when the Montreal -> Ho Chi Minh City flight pricing will come into effect?